How Effective Are Your Vendors' Business Continuity Plans? According to the recent Appendix J guidance released by the FFIEC, as part of its due diligence, a financial institution should assess the effectiveness of a third party’s business continuity program, with particular emphasis on recovery capabilities and capacity. Download our sample vendor Business Continuity Plan Review and feel free to use it as a guide for doing your own or contact us if outsourcing this type of work is right for you. 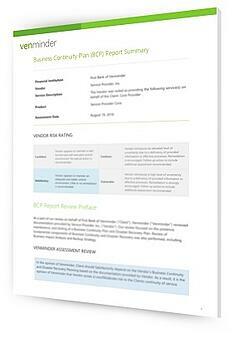 Look at the business continuity plans for your vendor product, including testing results and client-side requirements.